In England, Halloween ends and gives way to November in various ways: Pumpkins left on doorsteps begin their neglected descent into rot; the seasonal coffee flavoring changes to gingerbread; James McClean begins receiving death threats from a certain brand of soccer fan, including among his own supporters. 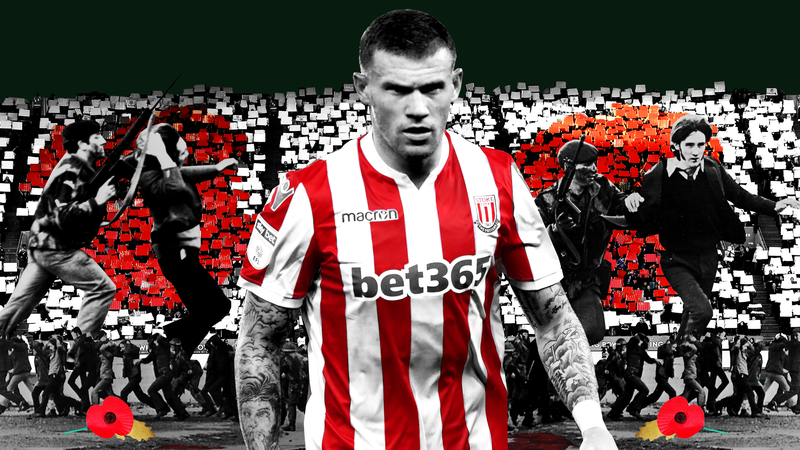 For the seventh year in a row, McClean, the Republic of Ireland and Stoke City midfielder, refused to wear a Remembrance poppy on his jersey to honor British military personnel who have died in war. Inspired by the poem “In Flanders Fields” by John McCrae, the poppy was originally adopted by the American Legion to commemorate American war dead, and was then co-opted by the British and worn exclusively on Remembrance Day/Armistice Day, November 11. Since the launch of the Royal British Legion’s charity drive, the Poppy Appeal, the poppy has become ubiquitous over longer periods of time than just the day itself, and it now appears everywhere in Britain for two weeks preceding the 11th, be that on a bus, on Cookie Monster’s flesh, on the Tower of London, on wedding cakes, and dresses. Not on dresses, mind you; they are dresses. Most commonly, poppies have become lapel pins for civilians and are sewn into the jerseys of British soccer clubs. Between the Poppy Factory in London and Lady Haig’s Poppy Factory in Edinburgh, the Royal Legion produces approximately 41 million poppies every year. To swim against that suffocating tide was only ever going to draw attention to McClean, and it has done so every November without fail since 2012, when he refused to wear one for his first English club, Sunderland, then in the Premier League. Sunderland said his reasons were “personal,” but McClean would later claim that he had been “hung out to dry” and told not to explain his reasons. It was only after he had left Sunderland, amid death threats and attacks from his own fans, for Championship side Wigan Athletic, that McClean clarified his rationale for not wearing the poppy. In any normal society, this historically contextualized and reasonable explanation would be accepted; not personally wanting to pay tribute to a force that indiscriminately killed peaceful protestors in your hometown seems perfectly sensible, but, as Colin Kaepernick came to learn years after McClean, anyone who questions the institutional war machine is immediately marked an outcast. It was expected that Stoke City fans would boo their own player and they did as he entered the field in the 82nd minute in Saturday’s game against rivals for promotion Middlesbrough. McClean was heckled and harassed with anti-Irish songs with every touch of the ball, but still played with his usual energy and commitment—his is a style that is all power and little finesse—getting in some crosses and winning some headers, but he was ultimately unable to alter the course of what was a dire 0-0 draw. After the final whistle, with McClean walking towards the tunnel to exit the pitch, Middlesbrough fans rushed the perimeter, having to be held back by stewards. McClean was later warned by the English Football Association for his self-censored use of the c-word. He in turn criticized the FA in another Instagram post for turning a blind eye to the abuse he has received in England, and directly said that such abuse was tolerated only because he is an Irish Catholic. The Irish PFA, the players’ union, and anti-racism organization Show Racism the Red Card have since called for an English FA investigation into anti-Irish sentiment. McClean has always doubled down: he has worn the Easter lily, which pays tribute to Irish republican dead such as Sands and Devine, and has on his leg a tattoo honoring Free Derry Corner, the historical landmark in Derry’s Bogside area that marks where republican paramilitaries operated a no-go zone for British forces from 1969 to ’72. McClean was always likely to face abuse during this particular fixture; both Stoke and Middlesbrough voted heavily in favor of Brexit, pointing to a deep undercurrent of British nationalism in their local supporter pools that would always take offense at a Catholic from Derry criticizing any aspect or action of the British Empire. He wasn’t helped by Stoke City releasing a statement of their own in the run-up to the game announcing that McClean would not wear a poppy against Middlesbrough or in the following weekend’s game against Nottingham Forest. What was just a run-of-the-mill statement intended to confirm what didn’t need to be confirmed instead allowed resentment to build in the days leading up to the game. Manager Gary Rowett backed McClean, but Stoke are set for “internal discussions” about where to go from here. Stoke, and British soccer as a whole, have not helped the climate around McClean. Just two days after releasing their statement, Stoke posted a tweet with Rowett sitting at a mounted machine gun to promote something called Military Matchday. It was a jarring example of the militaristic malaise of critical thinking that has infected imperial societies such as the U.S. and Britain; support for armies and the wars they fight in are considered the default position, something so universal and inoffensive that posting your manager behind a death machine seems perfectly normal and not worth a second thought. The limited timeframe in which are poppies worn also does not help; imagine the jingoistic fervor that precedes every sporting event in America and concentrate that into just two weekends in November. Coupled with the stances of the Scottish, Welsh and English football associations—the English FA threatened to bring FIFA to the international Court of Arbitration for Sport when all three national teams were fined for wearing poppies, which violated FIFA rules for displaying political symbols—an atmosphere has been created where even slight deviance is considered the worst of all sins: disrespecting the troops. As both McClean and Kaepernick have discovered, anything can be the troops. The flag is the troops, the poppy is the troops, police officers that kill unarmed black people are troops, a national anthem is the troops. Underlying the howls of those who can’t handle Kaepernick’s or McClean’s statements is the idea of the ungrateful savage who should be happy to have a place in the empire: When a millionaire black man in America or a millionaire Irishman in Britain speak of the routine slaughter their people have suffered over generations, they are told to be happy that they are not among them. The thinking goes that Kaepernick should be appreciative that he was never enslaved or killed by a cop and McClean should feel indebted that he did not join the ghosts of the Creggan estate, and they should both shut up and smile. A precedent for the treatment of soccer-playing northern Catholics in Britain was set with Neil Lennon, the former Celtic player and manager, sometime Northern Ireland captain, and current manager of Hibernian in Edinburgh. Lennon retired from playing with Northern Ireland in 2002, six years before his club career ended, after receiving a death threat for saying that he wanted to represent a United Ireland. Playing for Northern Ireland as a Catholic was never easy for Lennon, but after he joined Celtic, a Glasgow club founded as a charity by an Irish Marist brother to feed the city’s poor Irish immigrants, it became impossible. Similar to McClean, he was taunted by his own fans with chants of “We’ve got a Provo [PIRA member] in our team.” The targeted abuse of Lennon has never subsided: fans of both Rangers and Heart of Midlothian, two clubs from Glasgow and Edinburgh respectively with largely British nationalist fan bases, have physically attacked him. Just last week, he was hit with a coin by a Hearts fan during the Edinburgh derby and “Hang Neil Lennon” was painted on a wall near Hearts’ stadium. McClean has avoided the baggage of playing for Northern Ireland thanks to the Good Friday Agreement, implemented four years after Lennon was cap-tied by the north, which ended the Troubles and guaranteed the right of anyone born in Northern Ireland to either Irish or British citizenship, or both. McClean’s Irish passport allowed him to switch from the north, who he represented at underage level, to the Republic of Ireland, which led to the first death threats of his career. McClean admitted to taking advantage of the system to better himself, but added that he never had any aspirations to play senior international football for the north. When you consider the treatment of Lennon, the crowd’s behaviour and the fact that the north play in a stadium named for the British royal family, it’s no wonder that northern Catholics like McClean, Shane Duffy, Marc Wilson, and Eunan O’Kane have declared for the Republic. (Some Catholics, like Liam Boyce and Niall McGinn, have represented the north since the GFA, but those who opt to do so tend to be players who weren’t good enough to earn caps for the Republic.) Indeed, it is for the Republic that McClean, whose club career has been spotty at best, has turned in his best performances, including the goal in Cardiff that knocked Wales out of the World Cup qualifiers. Maybe it’s the tactics of Martin O’Neill, McClean’s fellow Derryman who gave him his Sunderland debut and now manages the Republic, that favor the winger’s hard running style. Maybe it’s the freedom of playing for a crowd that won’t call you a Fenian or a Provo the second your cross doesn’t find a striker. Just as NFL players even being on the field for the national anthem is a “time-honored” tradition that in reality only dates back a few years, the poppy has only been worn on jerseys since around 2006—one of the pioneers was McClean’s former club West Bromwich Albion—and became uniform around 2012, the year of McClean’s first refusal to wear one. It has been protested before in much more explicit terms; in 2010, when Neil Lennon was manager of Celtic, the Green Brigade section of ultras hoisted a banner and released a statement referencing Bloody Sunday and British military operations in Iraq and Afghanistan, calling for the removal of the “bloodstained [sic] poppy” from Celtic’s hooped jerseys. English soccer has always been a hotbed for an almost accepted level of British nationalism, one that inevitably manifests itself in anti-Irishness; not the kind of anti-Irishness some Irish-Americans believe exists and affects them, but real-life hatred of former and current (McClean’s Derry is still under British control after all) colonial subjects expressing themselves. Contrast the reception McClean received last weekend, and will receive this weekend, with that of Nemanja Matić, Manchester United’s Serbian midfielder, who also didn’t wear a poppy last weekend. Matić’s story originally followed the same line as McClean’s, with sources saying the refusal was for “personal reasons”; he then explained in an Instagram post that living through NATO’s bombing of Yugoslavia as a 12-year-old had caused him to re-evaluate his position—he had worn one in previous years—and play without a poppy. It’s something of a surprise that it has taken someone other than McClean this long to refuse to wear the poppy; of the 351 foreign players in the Premier League, only 10 come from countries never invaded by Britain. Maybe it’s that Matić speaks with a Serbian accent rather than a Derry one, or maybe it’s that no one has yet threatened to publish his address or tattoo a poppy on his wife’s face; no former soldiers have threatened to kill him and drag his body past a cenotaph. When Martin O’Neill was Sunderland manager and the former British soldier Cody Lachey had threatened to kill McClean in 2012, he was quoted as saying, “James has lived with a lot of things.” Those things included growing up in an economically deprived and war-scarred city, with a history of gerrymandering and purposeful destruction of infrastructure to depress the Catholic majority, and being on the receiving end of death threats before he had even made a senior appearance for Sunderland. That we are stuck in the same position, having the same conversations seven seasons and three transfers for McClean later, says more about life in English soccer than it ever could about him. “He’s getting death threats now, so that doesn’t help,” O’Neill added. For those who would force him to wear a poppy, and for McClean’s hopes to just play some soccer, it’s hard to see how it ever could. Odrán Waldron is a freelance writer from Ireland, whose work has appeared on VICE, New Socialist, An Poc and Pop Matters, among others. You can follow him on Twitter @odranwaldo and follow his writing at www.clippings.me/odranwaldron.